Since we offer a large range of this genus it is impossible to bulk them into one catorgory for cultural treatment. However it is essential to have good drainage for all species. Plant about 10cm deep, generally flowering late March to early May. 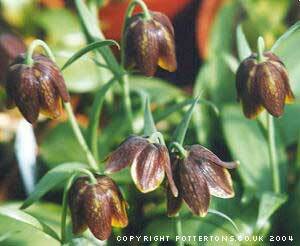 Hardy in a garden unless stated otherwise and then they should be grown in pots, in an alpine house or cold frame. Large nodding flowers of green, maroon on the inner segments, recurved pointed purple tips. 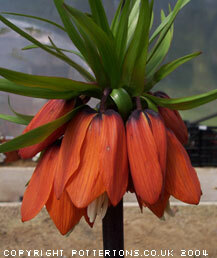 A distinctive & tall growing species from Asia Minor, up to 35cm, hardy for well drained rockery or raised bed. 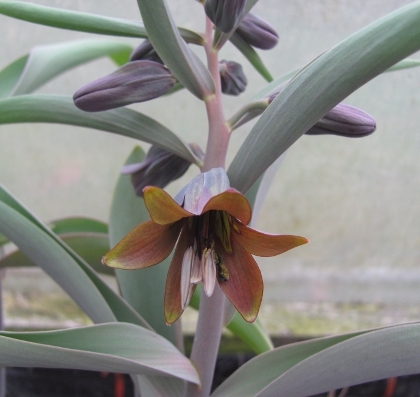 Pendulous maroon flowers to 30cm in April, inside golden-bronze with faint black lines, an easy hardy bulb for the rock garden. Flattish white flowers tinged slightly green to 15cm in March, a rare species that requires pot culture in a frame or alpine house. 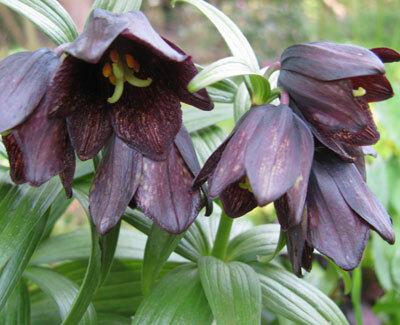 Very striking dark maroon-purple almost black flowers, on stout stems to 30cm in May-June. Prefers shade and a cool acid soil that never becomes too dry. 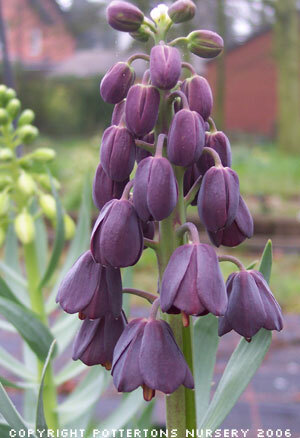 Short stems to about 15cm of olive-green bell-shaped flowers with chequered purple-brown stripes, March to April, reasonably hardy. 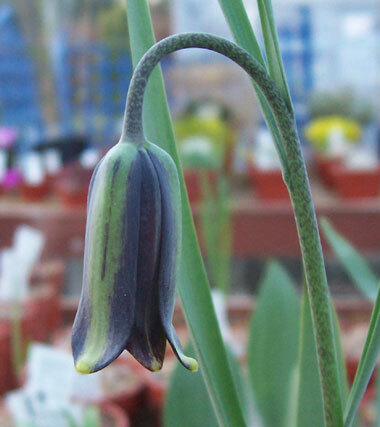 A beautiful dwarf species with deep chocolate brown chequered flowers, only 15 cm tall, lovely in a trough or pan. Hardy outside but possibly in need of extra drainage in wetter regions, or cultivate in cold frame/greenhouse. A rare type crown imperialis form but without the smell, a shorter growing plant to about 50cm which has large orange/yellow flowers, darker veins, flowering mid March. Purplish flowers with lime green streaking on tall stiff stems up to 35cm tall in April, superb hardy garden form for rockery or raised bed. 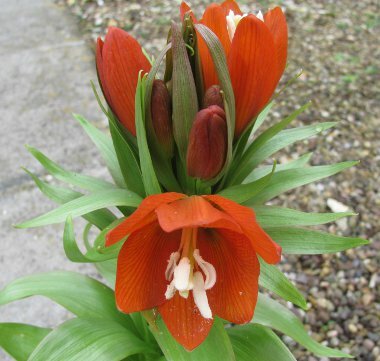 This is a vigorous variety with deep reddish orange flowers to 90cm. 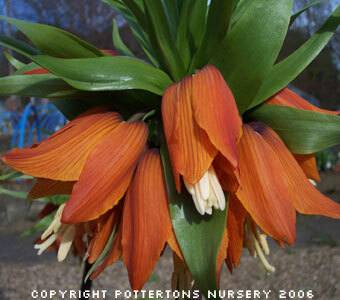 The following “Crown Imperialis Fritillaria”, are stately looking plants with stout upright stems supporting umbels of large bell shaped flowers that hang downwards in April - a most impressive sight. They need a well drained, deep rich soil and would benefit from a top dressing of high potash each year after flowering. 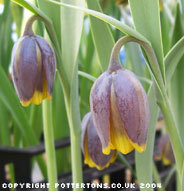 Plant the bulbs 10-15cm below the surface and cover with a well drained soil. 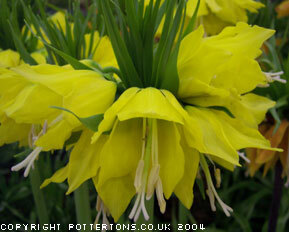 Top sized bulbs supplied. Very large solid yellow flowers on stems to between 60 and 90 cm. Large red-orange flowers on 60 to 90cm tall stems. New introduction with pretty, distinct light orange flowers. Very large bronze-red flowers, usually about 90cm tall. Long tubular flower with recurved tips to the petals in April, does well outside in our alpine garden - a sunny site in well-drained soil. 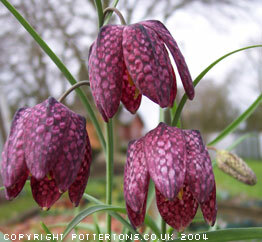 The Snakeshead Fritillary, a British Native with variable chequered maroon-purple flowers in April or May. Easy to grow in most gardens, very good for naturalising in grass or large borders providing the soil does not dry out in summer. The beautiful white form which is just as easy to grow in the garden, very lightly chequered in pale green, large flowers. Superb!! 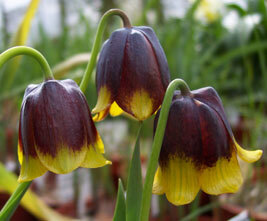 One to five dark reddish-purple flowers with a grey bloom, top third of each petal very bright yellow in April, 15cm. 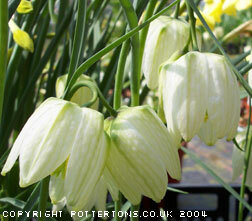 Hardy in well drained warm spot in the south of England or cold frame / alpine house in wetter/colder regions. A beautiful and very hardy species, broad grey leaves, with one or four very large pendent pale yellow flowers up to 35cm in May. Needs a rich peaty cool compost, in light dappled shade. Very elegant. 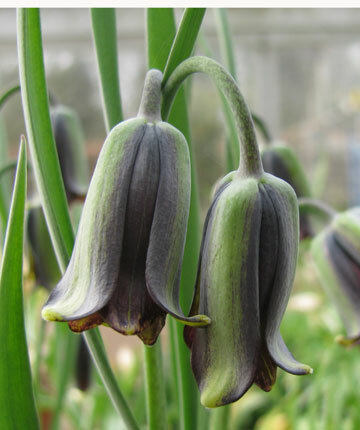 Large bell-shaped flowers on stems up to 90cm tall, covered with up to 20 blooms of a deep purplish-plum in a loose raceme in March/April. Prefers some shelter from strong winter winds. 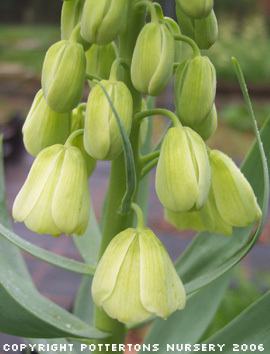 Impressive spikes of up to 30 creamy, faintly green bell-shaped flowers on erect stems up to 80cm. Its early growth dictates that a sheltered warm situation is needed. Plants in our garden this year flowered from March to early June. 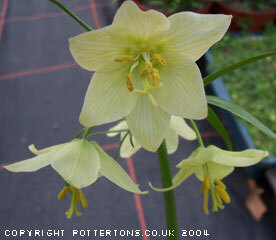 Medium-sized green flowers with light brown tips in April to 30cm tall, hardy, well drained soil in sun or semi-shade. 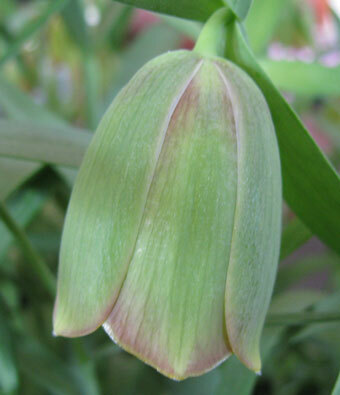 A stunningly beautiful form of Fritillaria imperialis with tall stems to 40cm topped with a crowded whorl of bright straw yellow flowers in March/April, prefers some shelter from strong winter winds. 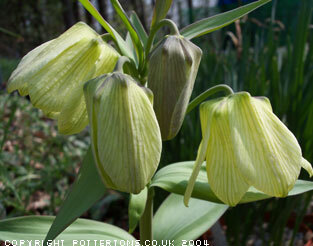 Broad grey-green leaves up the 30cm stem which carries up to ten bell-shaped flowers. 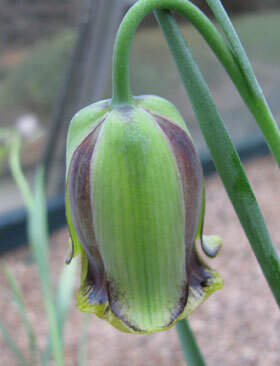 Clear green overlaid with purple, covered with greyish bloom in spring, prefers some shelter from strong winter winds.